In a recent guest post by Laura Briere of Vision Advertising, she offered 6 Tips to Turn Your Internet Marketing into Relationship Marketing to help you develop a strong foundation and build quality online communities. Let’s take relationship marketing a step further and talk about what it is and why it is important for every small business. 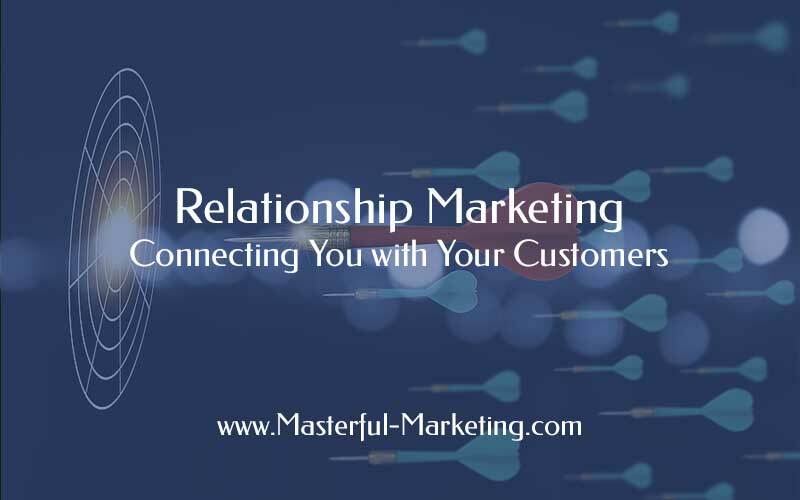 Relationship marketing is not a new concept but has increased in importance because of its effectiveness in attracting the attention of your target audience. The use of social media has put a spotlight on your business making it vital that you provide value to your clients while demonstrating integrity and trustworthiness. This ensures you have a loyal, happy customer base and a quality reputation. Makes prospects and customers feel comfortable and connected to you. So how do you help people determine whether they want to do business with you? Establishing credibility – Position you and your business as an expert in your industry by supplying information that is useful and relevant to your audience. Content marketing is an ideal relationship marketing tactic because it educates your audience with useful information. Most content marketing is delivered through your blog, social media or email. When a suspect is researching a solution, you become the go to resource for the information that can help them decide on a solution. If you’ve answered their questions through your content, they are more likely to come to you when they have other questions. This sharing of information begins to build a relationship that is valuable to them. Enabling connection – Connect with your audience by offering something of value that will get them to take action. If action is taken, you now have moved a suspect to the next stage – prospect – where you can continue to develop the relationship. At this stage, you supply them with more useful and practical information for their business. As you continue to develop the relationship, some of these prospects will see the value you offer and become customers. Once they do, you continue to strengthen and nurture the relationship, but now based on trust and loyalty. Building loyalty and trust – Focus on the customer’s needs rather than your own in order to build loyalty, gain trust and keep your brand top of mind. Your business will be judged by the perception of how you treat your customers. By providing superior customer service and helping them succeed, you turn a customer into a partner. When you have reached this type of relationship with your customer, you can then determine if you can turn them into a brand advocate – a resource that speaks highly about your company, shares your information with their peers and works with you to promote your products and services through reviews, success stories and referrals. Once you have turned a prospect into a customer, you must continue to add value to the relationship so that their connection to you continues to grow. It is far less expensive to cultivate your existing customer base than it is to seek new customers. When you develop a strong and loyal relationship with your customers, they will speak highly of you and provide referrals to your business. How are you building relationships with your target audience? Thanks Laura, your post was a great foundation.